If you are asking yourself the question of whether you should use a resume template to build this all important document, let us help you out with the answer: most certainly, yes. Regardless of what stage of your career you are in, building a resume from scratch is like shooting around in the dark hoping for a bullseye — you can try all you like, but your chances of success are purely up to fate. But this is no reason to fret. By choosing a job resume template from our platform, you will have a partner on your journey to employment success. A simple resume template is the foundation of an effective job application. Our templates are the product of careful research into what works when it comes to getting hired. Each simple resume template has been thoughtfully constructed with different kinds of job seekers in mind. Why not take advantage of the expertise of those who know the job market and have used tried and tested methods to build the scaffolding of your success? Here are the top three things you need to know about each resume template in our library. HR approved! Each one page resume template is vetted by HR, meaning these documents are far more than pretty formatting. They’ve been built to work for you. Easy to use. We’ve done all the slog work for you. All you have to do is input your details, and we’ll do the rest. No more slaving over margins to ensure that they align, or wondering how to format your page. Accompanied by a vast array of pre-written examples so that you can ensure that you get your wording just right. Don’t leave your future up to chance. A basic resume template from Resume Build is like having a career counsellor, copywriter, HR consultant and formatting whiz all rolled into one. If you are serious about making steps toward a career that truly reflects your skills and talents, make the choice that will lead you there directly. Why not start by selecting an easy resume template from our catalogue and get building today? Before we launch into the types of resume templates available, let’s touch on a few issues that many people in various industries face when it comes to finding the perfect resume writing template. The quick answer is that your resume should typically be one page. While certain fields, like academia, may require a curriculum vitae that further details every element of your experience and publication histories, the vast majority of professions only require a one page resume. HR departments want to get to know you in a flash through this document. There is no time to waste on details that don’t matter. Especially if you are at the beginning stages of your career, it can be difficult to know where to start. You might have received conflicting advice from a range of different sources, leaving you wanting for clear guidance. That’s where we step in. 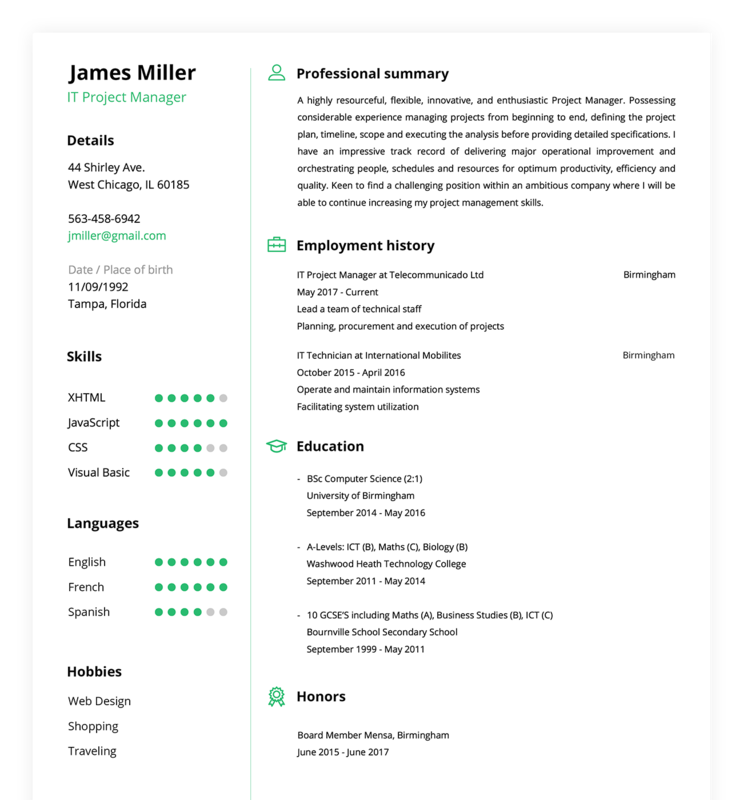 By offering you a one page resume template library, we allow you to choose which layout best suits your specific purposes. Many word processing programs offer a basic resume template. While this may have been useful in the past, technology has moved on to provide you a more comprehensive solution to your resume making needs. Each job resume template on our site has been specifically formatted according to the stipulations of hiring departments in various industries. We go further than providing you with formatting help and into guiding you toward a document that truly puts your best foot forward. Using a resume writing template from our site means knowing what to include and what to exclude. It means receiving advice from the library of examples we provide. It means being able to input your information easily and download your completed resume in a flash. It doesn’t mean having to battle with preset formatting that gives you grief as you try to manipulate it. Don’t struggle with templates that will only leave you more frustrated than when you started. The requirements of each industry are slightly different. With that in mind, we made the choice to bring you a library of templates that cater to the varying needs of individual job types. We’ve also made sure to include samples from a variety of sectors to ensure that you are able to find what you need. This is not a cookie-cutter process. We understand this and have responded accordingly. As a job applicant, your goal has to be to emerge from the pile. You have to show them that you are the candidate that has that little something extra. Achieving this on your own is like trying to go to the Olympics without a coach — it’s just not very likely. This is why you need a resume writing template. It will add sophistication and professionalism to your resume that you will struggle to achieve alone. Our easy resume template builder certainly will. Knowing what to say and the writing style in which you should say it can be extremely challenging. That is why we have provided an entire library of successful examples and samples for you. By looking through what has worked for others, you will quickly be able to gauge the right tone to use. You’ll also be able to see what others have included and, sometimes more importantly, what they have excluded, so you can make these all important decisions for yourself. This is what you need to add professionalism and flair to your resume. Now for the next step — choosing a resume writing template appropriate to where you are in your career. By now, you may have realized that no two resumes will be alike. Ultimately, your resume has to be a true reflection of you and your history. A basic resume template is your vehicle to get there. Whether you are looking to create a student or employment-seeking resume, we will help you arrive at your destination. One of the most distinguishing features between one page resume template types pertains to your career level and objectives. Where you are on your journey has direct bearing on what you choose to include and what you choose to exclude on your resume. While that award for debate in high school may be important to include on that student resume that gets you into college, it might be worth omitting it when you near mid-career. Let’s have a look at the challenges faced by each career stage, and how to find the most appropriate job resume template for every level. If this is the phase you are in, you may be finding the task of finding the ideal basic resume template rather intimidating. This is your first foray into the world of job applications. Many entry-level applicants feel as though they have nothing to include. How do you manufacture an employment history when you don’t have any experience? How do you stand out from the crowd when it feels like you do not have sufficient data to input? We’re here to help. Through the combination of templates and samples, you will quickly see that you are not alone. There are ways to present your information in a compelling manner that will make you surprise even yourself with what you have already accomplished. Think of leadership opportunities that you have already had, extracurricular endeavors that highlight specific personality traits and abilities, and ways in which you have proven to benefit your community. By choosing the right basic resume template on our platform, coupled with gaining insight from our library, you will be so much closer to launching yourself above the competition. By the time you arrive at mid-career status, your resume challenges are different. While you now have more experience to highlight, other questions arise. At this stage of your career, one of the biggest challenges is working out what to exclude. Those items that were necessary earlier on your career may not be so pertinent as you move into this next phase. Regardless of your industry, you will be able to find a mid-career job resume template that suits your purposes so that you really stand out from the pool of applicants. By consulting with HR professionals, we have created the resources you need to rise to the top. When it comes to finding your dream job, there is no reason to leave it up to chance. With a simple resume template, you will quickly separate yourself from the pack. Start building your new resume today. You never know. This just might be the beginning of your next big adventure.